Obituary – Crews, Nanellah Sue (Folsom) « Perry High School Alumni Association, Inc.
Christmas Vespers ’58-’61, F.T.A. ’60-’61; All School Revue ’58-’59. Nanellah Sue Crews, resident of Perry, passed Tuesday, December 23, 2014 at the Perry Memorial Hospital. She was 71 years of age. 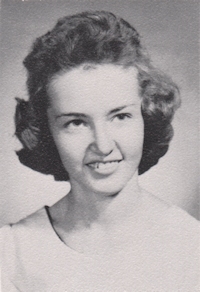 Nanellah was born June 26, 1943 at Perry, the daughter of Bill Folsom and Helen Albright Folsom. She was a graduate of Perry High School and attended business college in Sapulpa. Her enjoyments were her grandkids, plants and wind chimes. She is survived by three children, Troy Crews, Tamara S. Winters, and Darren Crews, all of Perry six siblings, Ann Givens, Willa Coker, Hope Sparks, Marty Rother, Richard Folsom and Frank Folsom 11 grandchildren 8 great grandchildren with one on the way other extended family and friends. She was preceded in death by her parents her husband, John Franciss Crews and one brother, Glenn Folsom and one brotherinlaw, Bill Stover. A memorial service will be held at 3 p.m. Monday, January 5, 2015 at the Kaw Street Chapel, 420 Kaw Street in Perry.